We’d love your help. 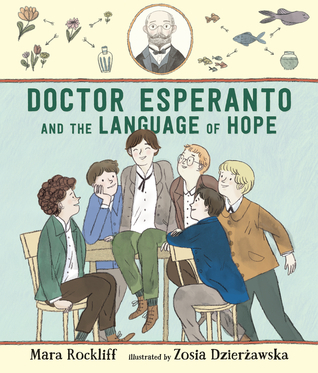 Let us know what’s wrong with this preview of Doctor Esperanto and the Language of Hope by Mara Rockliff. Meet the boy who made up his own language -- and brought hope to millions. Once there was a town of many languages but few kind words. Growing up Jewish in Bialystok, Poland, in the late 1800s, young Leyzer Zamenhof was surrounded by languages: Russian, Yiddish, German, Polish, and many others. But the multiethnic Bialystok was full of mistrust and suspicion, and Leyzer cou Meet the boy who made up his own language -- and brought hope to millions. To ask other readers questions about Doctor Esperanto and the Language of Hope, please sign up. I received a free ARC of this book in exchange for my honest opinion. Wow, I loved this book! It is a fantastic story about a truly inspiring family. I had no idea about the story behind the Espéranto language. Zamenhof was a Jew born in Russian occupied Poland and so he heard and learned multiple languages as a child. His theory was that a common language (such as Espéranto which combined elements of many languages) would lead to peace. I just think this concept shows Dr. Zamenhof’s spirit. The reality is much more complicated isn’t it? But, I love the concept that if we could all just understand each other verbally then we could find a way to really know each other. The author also does a great job in presenting this language. She explains it simply, shows the language development over time, and gives us the words in a way we can understand them. This storybook has a happy ending showing the world-wide growth and the love and understanding garnered by this language. At the end of the book there is a short biography of Dr. Zamenhof which led me to do a bit of research on my own. He was such a fascinating man. Dr. Zamenhof’s children continued his work after his death. His son was an ophthalmologist who did a lot of work on “blind spots”. His youngest daughter was a writer and toured the world. I couldn’t find much on the older daughter. The sad part is that they all died during WWII in Nazi concentration camps. Truly, the travesty of the Holocaust becomes ever more heartbreaking as we encounter real people who suffered and died. I loved that the illustrator is from Poland. She said in her blurb at the end of the book that she used old “photographs, paintings, and stories” to help “soak” herself in the story setting. It really shows throughout the book. The outfits of the people are just beautifully detailed and the settings are staged as if I was watching a play. The pictures immersed me in Zamenhof’s world. The illustrations also played a role in showing the language development and meaning of words. What a great historical story! Charming illustrations, well-crafted text, and excellent background information. Mara Rockliff is the author of many lively historical books for children, including Mesmerized: How Ben Franklin Solved a Mystery that Baffled All of France, winner of the Cook Prize and an Orbis Pictus Honor book. Her newest titles are Lights! Camera! Alice! The Thrilling True Adventures of the First Woman Filmmaker and Born to Swing: Lil Hardin Armstrong's Life in Jazz. Other recent books includ Mara Rockliff is the author of many lively historical books for children, including Mesmerized: How Ben Franklin Solved a Mystery that Baffled All of France, winner of the Cook Prize and an Orbis Pictus Honor book. Her newest titles are Lights! Camera! Alice! The Thrilling True Adventures of the First Woman Filmmaker and Born to Swing: Lil Hardin Armstrong's Life in Jazz. Other recent books include Around America to Win the Vote; Anything but Ordinary Addie: The True Story of Adelaide Herrmann, Queen of Magic; and Gingerbread for Liberty! (an ALA Notable Children's Book and winner of the Garden State Children's Book Award and Land of Enchantment Book Award). Under the pen name Lewis B. Montgomery, she wrote all twelve books in the popular Milo & Jazz Mysteries chapter book series.